Total hip replacements are performed for those with a damaged hip joint, when more conservative methods such as physical therapy or medication prove unable to alleviate pain and maintain mobility. Before surgery is ever discussed, your joint doctor will work with you to determine exactly what the cause and severity of your condition is. 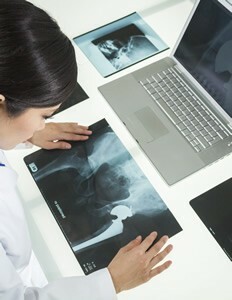 At Orthopaedic Associates of St. Augustine, Dr. James Grimes serves as our resident hip specialist. The dedication he shows to his patients allows us to provide the most comprehensive joint center in St. Augustine, Florida and the surrounding areas. Anterior hip replacement includes making a four-inch incision in the front of the leg (posterior replacements are done through the back of the leg). Rather than cutting through and later reattaching the muscles in that area, your joint surgeon is able to go through a naturally occurring gap in the muscles in the front of the leg, giving them direct access to the joint. This is one of the main reasons for a faster healing time. Intraoperative fluoroscope guidance, which provides the doctor with real-time X-Ray footage, helps the orthopaedic surgeon complete the procedure with incredible precision. From diagnosis, to treatment, to recovery and rehabilitation, Orthopaedic Associates of St. Augustine provides you with the best care and expertise in Northeast Florida. If you are suffering from hip joint pain, please request an appointment online or give us a call at 904-825-0540 to make an appointment today.